I’ve owned a few Fords in my life — from the ’78 Ford Bronco to my current 2003 Ford Expedition. Today, my truck crossed 200,000 miles. I’m not one overly attached to my truck. I love it, don’t get me wrong. It’s very comfortable, drives well, and the air works great. This being said, if you asked me my favorite vehicle I’ve owned… I’d be at a loss. I just don’t get emotional about vehicles. I did love my Bronco, and I have great memories with “her.” From taking the top off and driving to Fort Lauderdale beach to off-roading with a variety of people (including my Mom) throughout South Florida. Great truck. The Ranger (named Bubba) was a great one, too. Mostly the times me and Forrest headed out on the road. 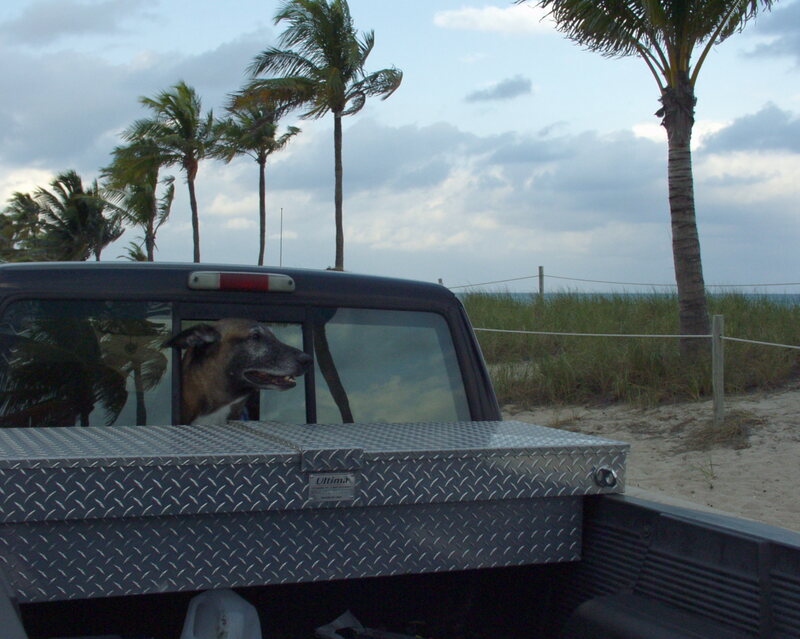 He’d stick his head through the back window and was simply a happy dog in that truck. The Ranger was my first new vehicle and I truly thought Bubba would be the last vehicle I bought new. Driving off the lot and realizing how much value I had lost (immediately) hit hard. This is back when vehicle loans were in the 8 – 12% range, and so I thought… next car will be used. After 130,000 miles or so, Bubba started to have some issues. By 150k, it was time for a change. I scoured used cars and trucks and found (higher than expected) prices. I wanted something a little roomier (I was getting bigger), something nice enough to use with clients, and something enjoyable on road trips—I’ve always loved road trips. Although I promised myself I’d avoid another new car, I soon noticed that a new vehicle would end up being the best choice. With finance rates around 7.5% when I was looking, the average car meeting my criteria would cost require an $18,000 loan and come with 50k plus miles. Ford really wanted to get rid of the 2003 Expeditions and offered 0% financing over 60 months. I figured it would cost me slightly more to get a much nicer vehicle with 0 miles… and I bought the green Expedition (which would later be named Greenzoto by Yeni). I’ve done a lot in this truck… I’ve driven from Florida to Michigan (and back) so many times, the truck can probably get there by memory. I drove Yeni’s wedding dress 1,000 miles. I took Forrest to the vet for the last time. I’ve watched Yeni sleep through countless states—and for the first time, I’ve driven a vehicle I’ve owned past 200,000 miles. Standing on the roof of the Bronco serenading our High School principal is my favorite memory and I actually (as a joke) listed “Fred’s Truck” as one of my pet peeves in my Senior Yearbook Bio. Good times which are missed. They are most definitely missed, brother.